Updated to align with the Next Generation Science Standards and Common Core Language Arts and Math, this interdisciplinary unit allows your students to explore the world of insects, understand the importance insects have in our lives, and to be apprentice scientists taking scientific data in the field. The program includes an instructional unit, a professional development workshop and a free docent-led field experience at Fermilab. 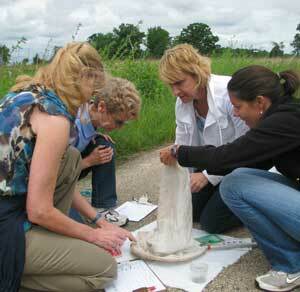 Teachers expand their knowledge of the importance insects have in our lives and in nature through many explorations. Teachers take home their own insect collection to use in the classroom. "It was 100% practical! I loved learning things that I knew I'd be able to use in the classroom. I entered the workshop at my principal's request, though I had little love of insects personally, but I left it appreciating insects and all they do for our world." Students practice being apprentice entomologists as they learn about Illinois' most common insects; the ones they can find in their own backyard! "The binder of ideas is invaluable. I was able to create an excellent insect unit for our second grade classes, which we've used every year since. The kids love it, too, from the songs to the games, to the worksheets and activities." Teachers who attend the workshop may bring students to Fermilab for free field trips every year. Students conduct field studies in three habitats—prairie, woodland, and wetland. Using simple scientific tools, they capture invertebrates, take data, and assess the quality of the habitats. Use the Field Trip Request Form. "Excellent! We were all so pleased with the field trip!! The docents were very knowledgeable and great with kids. Loved the 3 habitat visits + hunting for bugs." "Once we've completed our insect unit, the Fermilab field trip provides the perfect way to take the learning beyond the classroom. The docents know so much more than I do, and can point out details I'd certainly miss, in a friendly and exciting way. We love our Fermilab field trip, and do it every year!"